With the arrival of warm spring weather, Hudson River fish and wildlife are on the move! 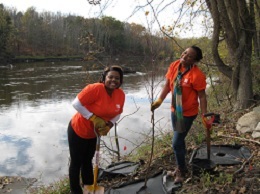 You can help DEC scientists and naturalists collect data on fish and wildlife and volunteer to plant native trees along Hudson River tributary streams. We invite you to participate in any of the following outdoor opportunities. Calling all Hudson River anglers! DEC is looking for help monitoring our striped bass population. The Atlantic States Marine Fisheries Commission requires each state to run a Cooperative Angler Program (CAP) to help collect statistical data useful in estimating the size of striped bass stocks. Anglers volunteer to keep a fishing logbook throughout the striped bass season (April 1 – November 30). 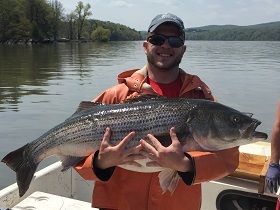 We send each participant a logbook at the start of the season, and they record the date, time, general location, and catch during fishing trips on the Hudson between the George Washington Bridge and the Troy Dam. At the end of the season, anglers receive a summary of all the information from the returned logbooks. If you are interested in participating or know someone who might be, please contact: r3hrf@dec.ny.gov. Information about the Cooperative Angler program and New York State saltwater fishing can be found on the saltwater fishing web page. 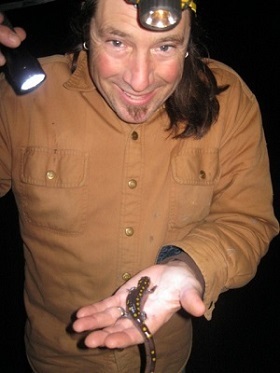 Have you ever witnessed large numbers of salamanders and frogs crossing the road on rainy spring nights? Ever wonder where they came from and where they're going? During early spring rains when temperatures rise above freezing, forest amphibians move from their woodland habitat to breed in vernal pools, often making dangerous road crossings. These amphibians migrate to breeding pools by the hundreds, if not thousands during “Big Night” migrations in late March or early April. You can help by telling us when and where you see migrations of woodland pool amphibians. Your observations will enable us to identify and map road crossings where salamanders and wood frogs are especially vulnerable, and learn more about where their habitats are located. Volunteers survey roads or known crossings for a few hours during “Big Night” migrations. All ages are welcome, but younger volunteers should be closely supervised due to road safety concerns. Data collection forms and instructions are available from the Hudson River Estuary Program and can be downloaded at www.dec.ny.gov/lands/51925.html. sarah.mount@dec.ny.gov at the Hudson River National Estuarine Research Reserve. Do you own or manage land along a stream? The Hudson Estuary Trees for Tribs Program offers free native trees and shrubs for planting along the tributary streams in the Hudson River Estuary watershed. Riparian (streamside) buffers help maintain healthy streams, improve water quality, and reduce erosion and flooding. We are looking for new sites for plantings, which take place in the spring and fall. Our staff can help you with a planting plan and work with your volunteers on site. Volunteers also help plant native trees and shrubs. For more information about the program including project applications and fact sheets, please visit www.dec.ny.gov/lands/43668.html or email the Hudson River Estuary Program's Stream Buffer Coordinator at HudsonEstuary@Tft.ny.gov.